Mukesh Ambani, World's Top Billionaire,with $21 Billion of Net Worth, has shared some business lessons, check out some money lessons from Mukesh Ambani which will help you in future building. If you are failing in financial planning, then these tips will help you out. These tips will help you in becoming better business man and to create more wealth and success in future. 1. Money is not everything, but money is most important. Mukesh Ambani has started from scratch. 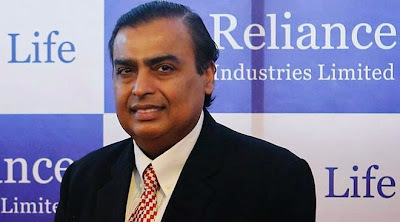 MBA College dropout mukesh ambani has seen his father dhirubhai ambani's business skill since childhood. And after Dhirubhai ambani's death, he made reliance industries on world top's company's name. He done lots of hard work to achieve everything. He listned to dhirubhai in lots of his business meetings, and that's why he says that don't run behind money, money is not everything, but money is important too. Don't Stop Dreaming. Dhirubhai always used to say that "Do watch Dream, Dream is no one's monopoly". Do watch dream and follow your dream, until you chase your dream. Make a plan to achieve your dream, and do take risk to chase your dream. Your Path to dream will be not easy, but it will show you path, next to your dream. 3. Always Do Right Things. Do not choose shortcuts, shortcuts are not always reach you to dreams. Your work will speak one day.So, keep doing right things, you will reach to your goal soon, for sure. Mukesh bhai has always invested in all the markets, from petroleum to Cricket (IPL). He said that he always follows his heart, he do whatever his heart says, and your heart is always right. Whatever it is personal or business things, always follow your heart. 5. Trust Everyone but don't depend on someone. Mukesh ambani said that if you want to learn something, learn from yourself, that's best option to learn. In starting of his career, he faced lots of problems, and he learned from this problems, mistakes. He trust his employes, officers, and also he always ready to face any problems. He said that the person who don't take risk will not make growth in his/her life. He took every risk which needed to create biggest business empire. He make some goals, then created plan to chase Goal and followed that plan with positivity. Not everything will be right for you, so you need to take risk and do learn from your mistakes and keep shipping towards your goal. You don't need stop in while, just keep hungry for success. Have patients, keep doing what you planned and you will get success one day for sure. People who left the work in middle way will never rich their goal. First lessons to success is learning. Always encourage your team to learn something, and always trust your team members. Always understand the work environment around yourself, and try to create better work environment for your team. Always stay alert for your competitors move. Think about betterment of customer, give best to your customer, you will get success for sure. 10. Understand current Situation, be innovative, Always accept the change, because change is the rule of world, even for business world. Things will keep changing. you need trust-ship to create inflow and out flow of money.